OSWEGO — An alumnus who was the first in his family to have a passport and had his life changed by a study abroad experience through SUNY Oswego has made a generous gift to the college to pass on the opportunity of international experience to current and future students. 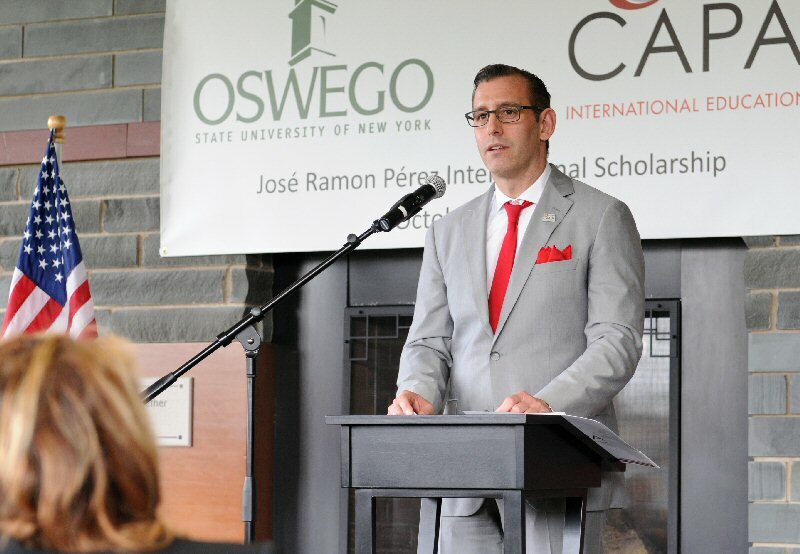 John Christian of the class of 1987, president and chief executive officer of CAPA International Education, and CAPA have pledged nearly $200,000 over three years to foster international education at SUNY Oswego. John Christian, president and CEO of CAPA International Education, speaks during an announcement that the 1987 SUNY Oswego graduate and his organization have pledged nearly $200,000 over three years to foster international education at the college. Christian shared his own story including humble roots in Troy and a life-changing experience at Oswego. Christian’s experiences both as a study abroad student and his work with Oswego’s international education program under Dr. José Ramon Pérez would form the basis of his life’s work. Christian praised the college’s global engagement and dedication to making it a prominent part of the academic experience. “The global thinker is on all of our agendas, the global doer is the Oswego agenda,” he added. A gift by Christian and CAPA of $100,000 over three years will support the Presidents’ International Initiatives, which will create opportunities for Oswego students, faculty and staff to infuse a global dimension into the teaching, learning and service mission of the college. A separate gift will fund the José Ramon Pérez International Scholarship, which will provide two full need-based scholarships for learning abroad opportunities for Oswego students – one to the CAPA London Program and one to the Beijing semester program – each year for three years. A total of six students will travel abroad under the scholarship during the grant period. Present at the ceremony were the winners of the Pérez Scholarship: Lindsay King will travel to Beijing and Megan Haufe received a scholarship to study in London. As part of the visit, Michael Woolf, CAPA’s deputy president for strategic initiatives, spoke on “International Education and Higher Education: A Complex Affair” to launch the Institute for Global Engagement Speakers Series.